Japan’s Hayabusa-2 probe yesterday successfully impacted an explosive charge on the surface of the asteroid Ryugu, creating a crater for observing the interior geology. 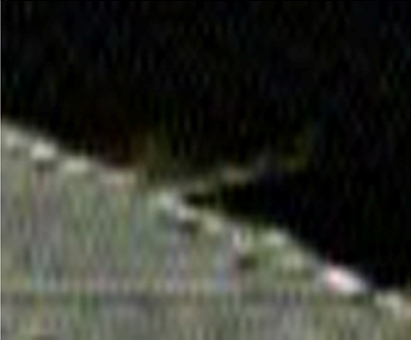 The image to the right was taken by a camera that has separated from Hayabusa-2 and stayed closer to the impact. It shows material flying off the asteroid’s surface, at the horizon line. Hayabusa-2 — which moved to the other side of the asteroid to stay clear of any ejecta — will next arc around and get close to this impact site to study it. They first need to make sure the ejecta has cleared. Is this the minor impact that changes the trajectory and directs this asteroid into a collision course with the earth? I do not know if that is so with this particular asteroid but I have always wondered about the potential of interacting with the asteroids that have been essentially put in their relatively “safe” orbits by the sweeping up and organizing nature of the planets and their gravity. If we were to attempt to lasso and “control” an asteroid in order to mine it might that interaction effect its orbit in a negative manner in relation to the earth? These objects are moving through space pretty quickly, the amount of “change in velocity” (and direction) required to alter their orbits, so as to impact Earth, is quite high. Visiting only perturbs the motion on a miniscule basis. If we start to intentionally alter orbits in some mining scheme, well…. “what could possibly go wrong?” (We can’t even pound a temperature probe much past a foot, into Mars. I’m seriously doubting we’ll be lassoing asteroids any time soon.) Besides, a million tons of Platinum for example, is only worth something and can only be utilized, when it’s on the surface of the earth. I suppose that it would be a matter of scale, I admittedly may not be thinking on the proper scale. I would think that in time that a formula would have to be constructed to determine what should and what should not be interacted with and how much might be taken away from the mass of an asteroid that might change in a dramatic way its trajectory. (?) Again, my untrained terrestrial mind may not be seeing this in the correct manner or scale. The materials mined in space and used in space would have its own value as determined by the market in space. So I will have to disagree with your assumption that the materials would have to be brought back to the earth to establish value. That process alone of terrestrial delivery would sky rocket the cost. And I have not any idea how far away this market is.